This is the front page of my reading homework for 5th graders. It is common core aligned, comprehensive, and obtainable for every student no matter their learning abilities and styles. This freebie comes with a note to parents. 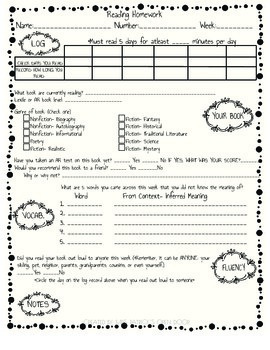 In the note to parents, all standards are listed that are covered with this one page reading log. I am sure this will be hit with students and parents! Be sure to check out my other resources in my store!